Jack Constantene is one of the few Grind Show operators who has claimed to become a millionaire via the Midway. 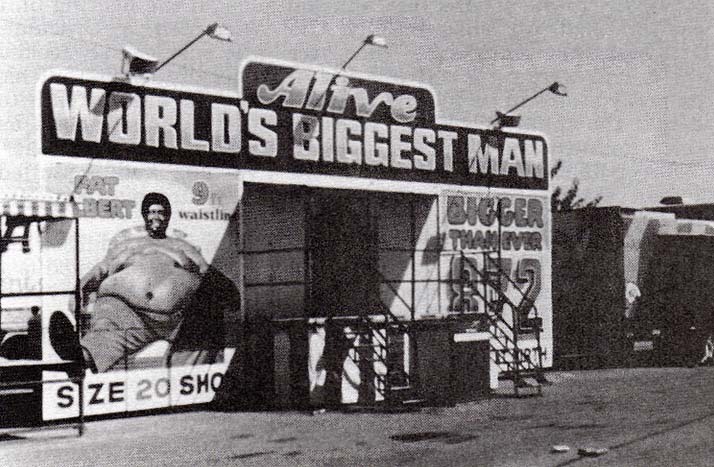 He has specialized almost exclusively in live acts, mostly midgets, and fat people, and is said to have made a fortune. For years he featured little Eddie Taylor (the World's Smallest Man), Ruby Saddler (the World's Smallest Woman), Fat Albert, and some miniature animal shows. His show front Southern body trailers are some of the best in the carnival world, and the artwork framing them is excellent. His show people tend to be black and he plays mostly the southern states where business has been good. On the road since the late 1970's, he entered the carnival trade by purchasing one of the earliest known versions of the Drug Abuse Show. Jack Constantene's FAT ALBERT Show. In the 1920's Lou Dufour was the King of the Baby Shows. In 1927 he had no less than 20 shows out in the field, which he labeled "The Unborn" Show. 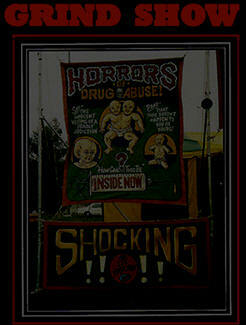 He owned his own carnival, the Dufour Exposition Shows, which at one point moved on 25 company owned railroad cars. With partner Terry Turner (an R.K.O. Pictures executive) he brought the "Ubangi Savages" Show to the states in 1931, causing a stir by opening the exhibit with a massive premiere in the 5,000 seat Massbaum Theatre in Philadelphia before joining up with Ringling Brothers Circus. At one time Dufour boasted a grand total of 38 shows under his control, and a gross of $500,000 at the 1939's New York World's Fair, a remarkable sum made even more incredible by the prewar depression days of America. A native of New Hampshire, Malcom Geary stills prefers to play the Yankee states with Billy Burr's Funorama Shows even though he is now based out of Tampa, Florida. Malcom has been described as a showman who would try anything. He once framed a hippy chicken show around the then hit song "The Funky Chicken" that operated on the principle that a bird placed on a hidden hot plate could be made to "dance" about frantically to the strains rock and roll music if the heating unit was cranked up substantially! He attempted a Dracula's Daughter Show featuring a "daughter" who suspiciously looked like a man wearing a bad wig and a Mystery Museum, but his mainstay seems to be the live animal show. 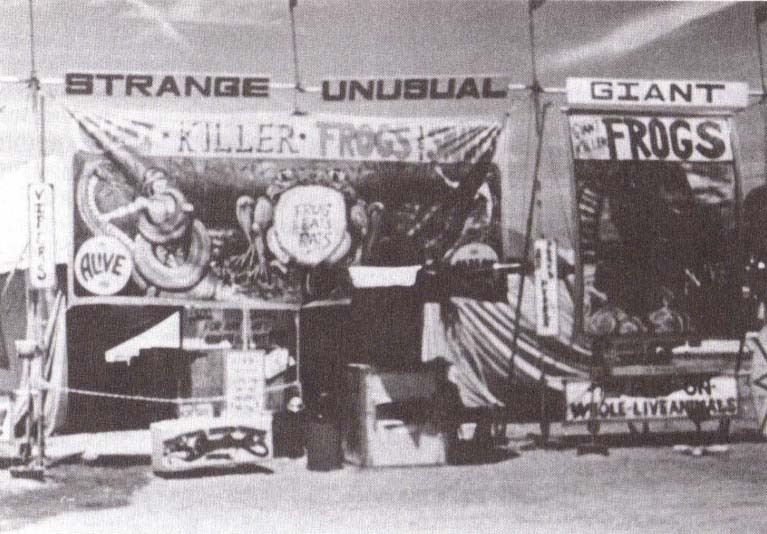 He was the first to feature the Giant Frogs, and carried Rat and Snake shows as well. Recently he went on the road with his TWILIGHT CREATURES Show, which features live bats and a stuffed African monstrosity I traded him for a mounted Giant Rat (Nutria) for my Amazon show. His home itself is like a museum with many oddities and taxidermied animals in residence, including a five-legged pet beagle that accidentally hung himself on his chain one day and now sits patiently, stuffed, in one corner. Malcom Geary's GIANT KILLER FROGS Show.